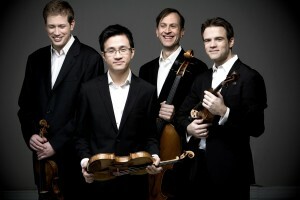 In July 2009 the New Orford String Quartet arose from the fame and tradition of its glorious predecessor, the Orford String Quartet, with a sold-out first performance at the Orford Arts Centre. Reviews of the debut concert in the Montreal Gazette praised a performance that was “sweet, balanced and technically unassailable less than a week after their members met for the first time. . . . Lustily applauded in the Orford Arts Centre, the concert was true to the Orford name in its beauty and refinement.” In the short time since its creation, the New Orford String Quartet has seen astonishing success, giving annual concerts at the Orford Arts Centre for national CBC broadcast and receiving unanimous critical acclaim, including two Opus Awards for Concert of the Year. Hailed for their “ravishingly beautiful tone” as well as their “extraordinary technical skills and musicianship,” the members of the New Orford String Quartet are all principal players in the Montreal and Toronto Symphony Orchestras.